I spent part of the morning with my friendly dentist, Dr. Martin Von Heuvalnussen. I don’t really know if that’s his surname but it’s close. 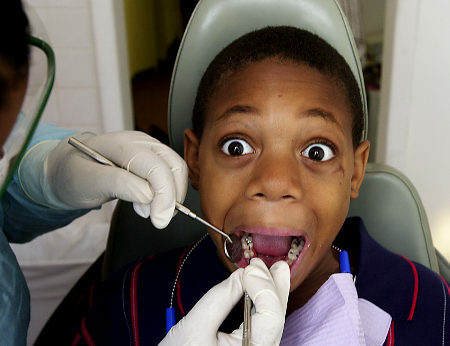 When I was a kid I was so terrified of the dentist that once I refused to open my mouth for him. I got into a lot of trouble for that and I learned that the wrath of my parents was worse than the prodding of the dental instruments so I was much more obedient after that. Let me tell you about my childhood dentist — Dr. Maria Baltarowich. She didn’t believe in novocaine, telling me I was a “big girl” as she held my jaw open with her fat hand. My dad finally stopped taking us to her when she pulled a tooth out of my sister’s mouth without consulting anyone. Our dentist uses novocaine, but they haven’t been giving us toothbrushes lately either. Sheesh, how do they expect us to keep our teeth clean? Hope you didn’t get a throbbing headache!